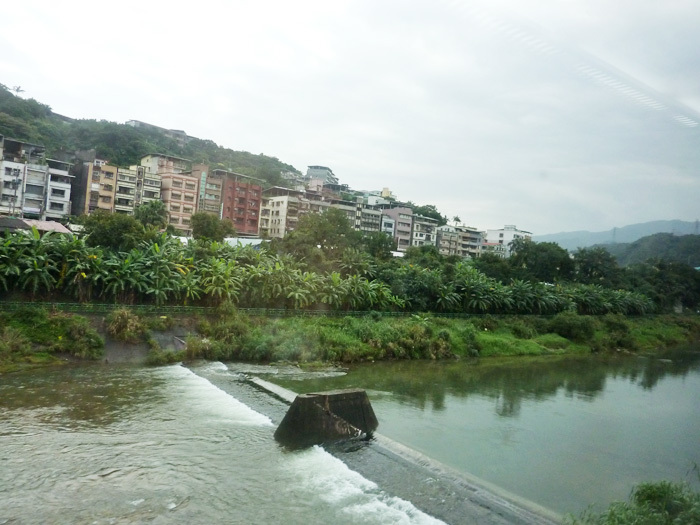 Yangmingshan was so pretty so my mom and I decided to see more nature landscapes! 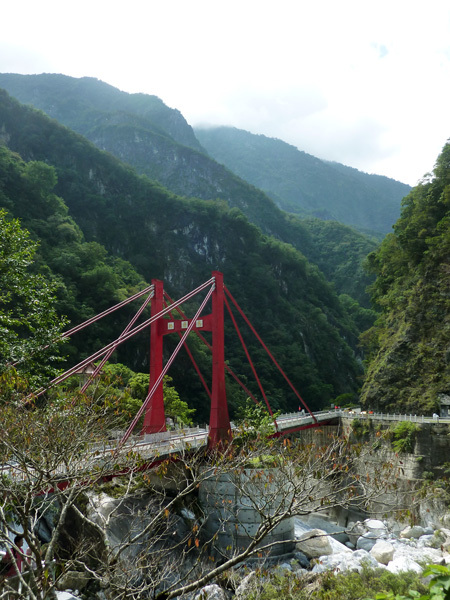 The night before, I did some extra research on traveling to Taroko Gorge (太魯閣); one of Taiwan's top tourist destinations, but it was 2 provinces away in Hualien. It required a train, and then either a bus or cab; taking a cab offers less of a worry since there are only a total of 4 buses going into the gorge for the whole day. Wouldn't want to be stranded in the wild. I got up at 5.45am and since it was a Friday I was worried all night that I couldn't secure train tickets lol... Actually it's best to book 2 days in advance for a peace of mind. 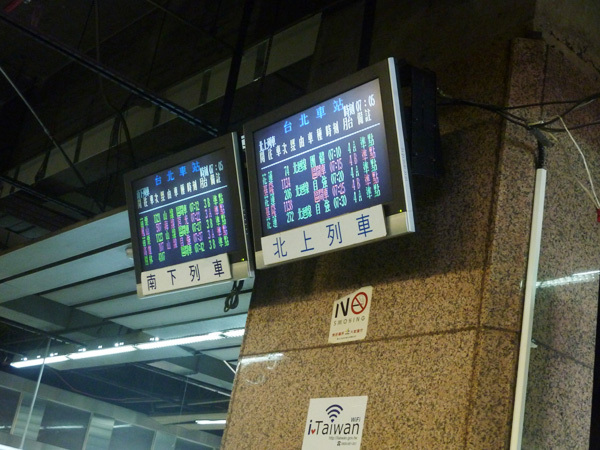 Managed to book seats for the 7.20am Tze Chiang (自強) Number 206 train at Taipei Railway Station, just look for the two triangles 'mountains' symbol on the timetables (if you are looking at online schedules). 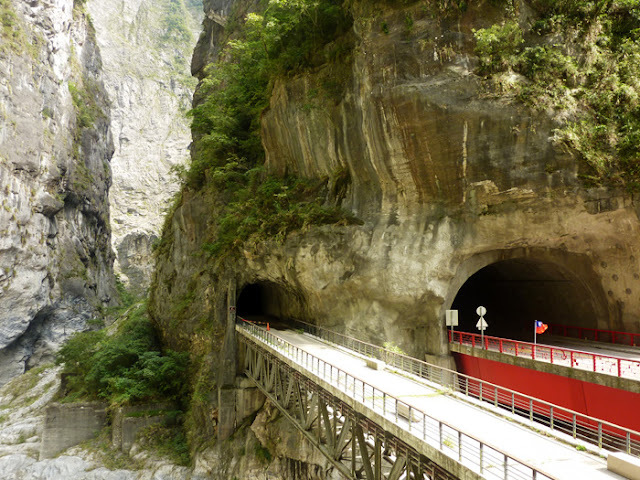 It is an express train from Taipei to Taroko and has less stops. 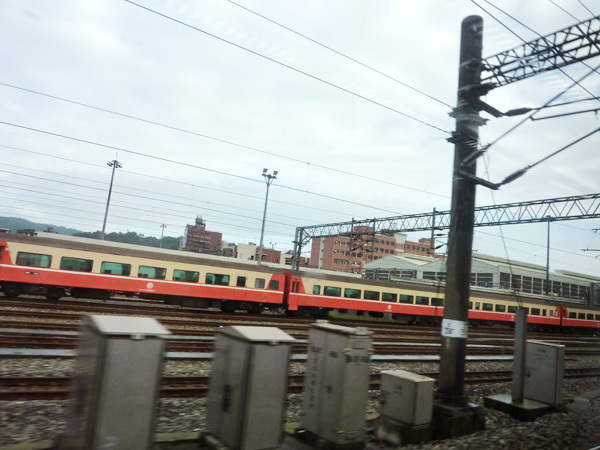 This is not the High Speed Rail (bullet train) but the normal train. 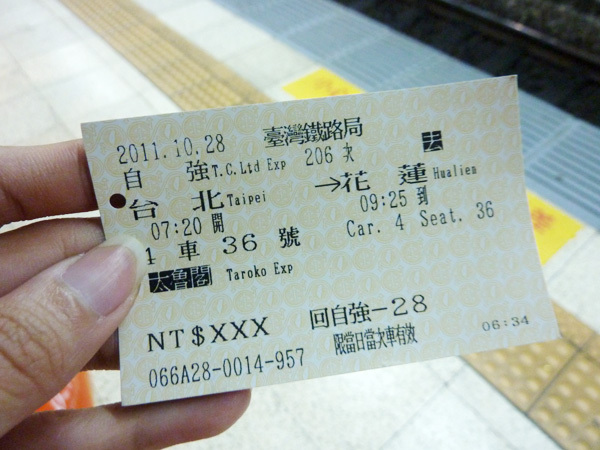 I chose the Tze Chiang is because it is faster and more comfortable. There are cheaper trains available but too lazy to look. 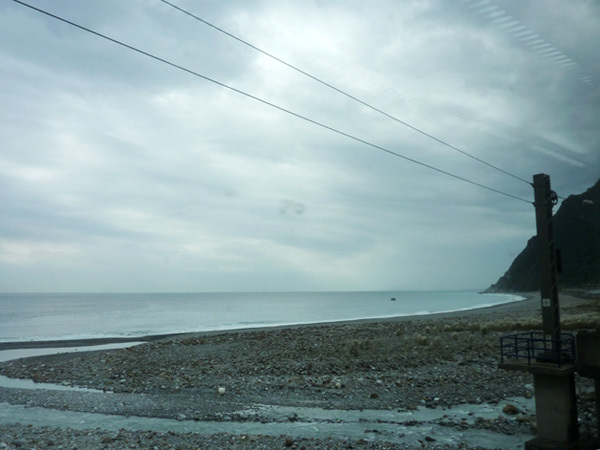 My train reaches Hualien at 9.25am, about 2 hours of commuting. 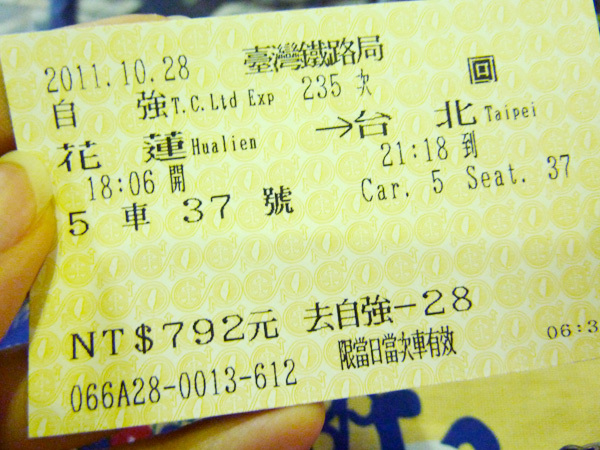 Booked return tickets as well, the 6.06pm Hualien train back to Taipei. Total is 792NTD (about US$26.25) for them. 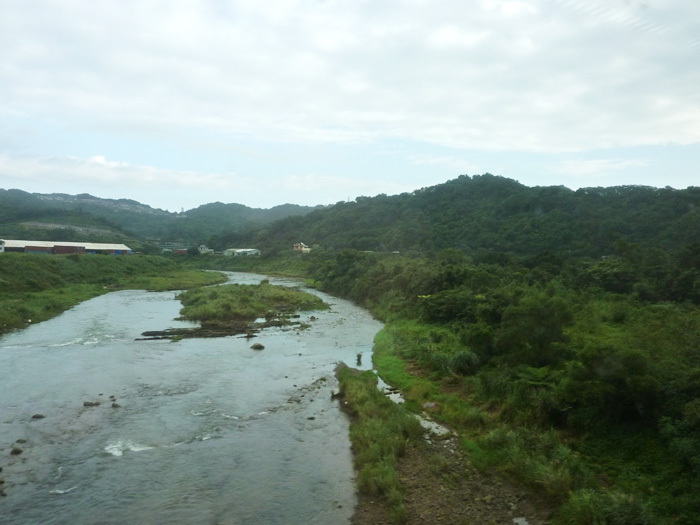 Nice scenery while on the train. Try to book left seats if possible. The morning sun peeking out! This is passing through Yilan (宜蘭) province I think. 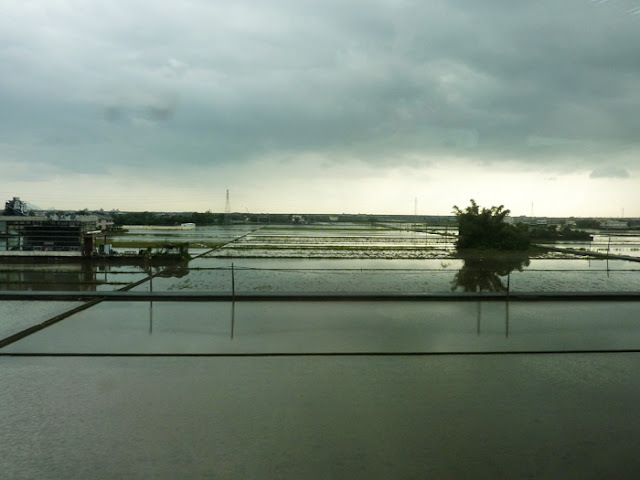 Padi fields? 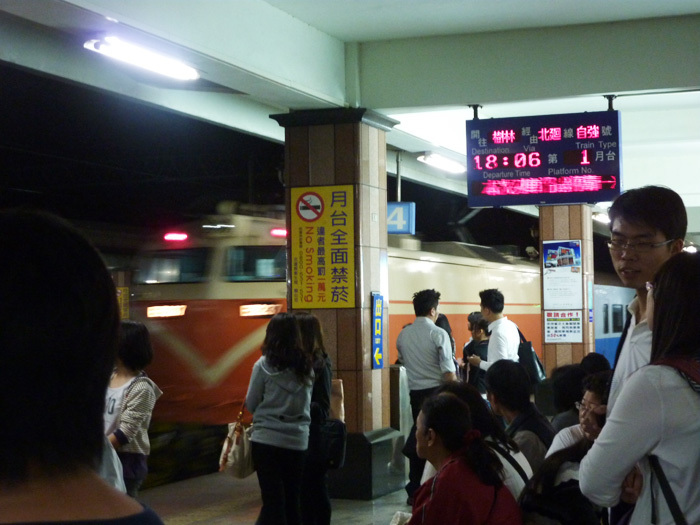 Upon reaching our destination, there was a queue of taxis waiting for tourist business just outside the train station. 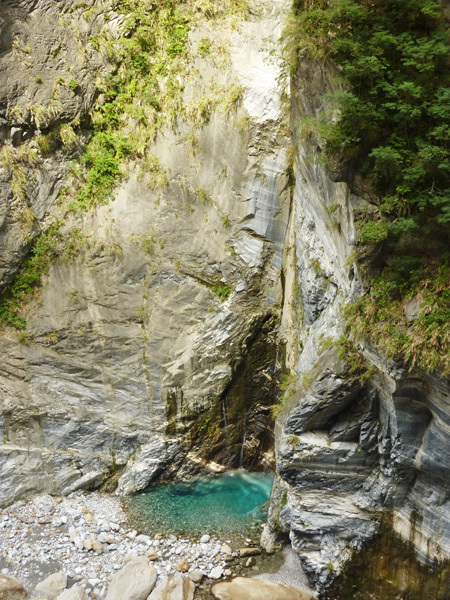 All of them offer day tours to Taroko Gorge. Simple. They are just normal yellow cabs. 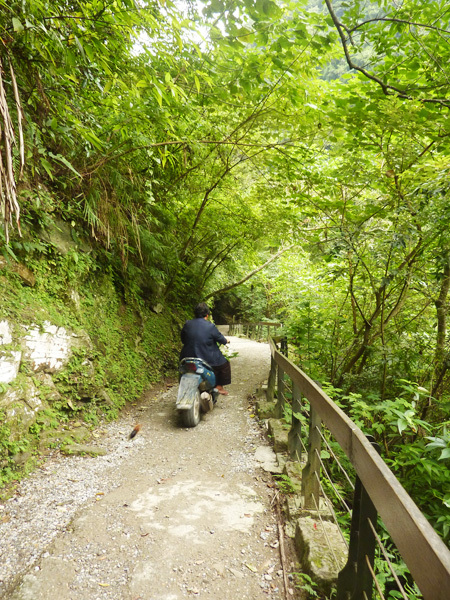 The price is 2,000NTD (US$66.25) to take you around the mountains for a day. Standard fees, don't pay more than that, unless the price has risen. The cab drivers speak Mandarin and Hokkien only. I read online about English tours being available, but these cost 3,000 - 5,000NTD depending on how many people are in the cab. I just went with whoever approached me first, the man is the first in line anyway. His name is Mr Hu, license plate 551, very friendly and a safe driver. He brought us to the main areas of interest, took photos of us, introduced the sights and best of all, his car doesn't smell of cigarette smoke. 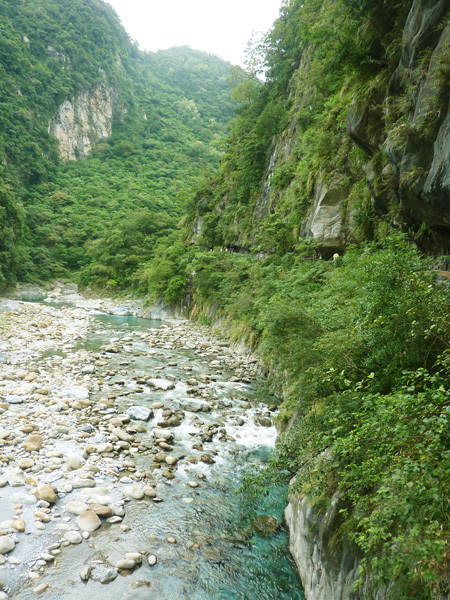 Mr Hu asked if we wanted to visit a scenic broken cliff (清水斷崖) just before going to the gorge, that would be an extra 500NTD since it was diverted off the route, we said ok. 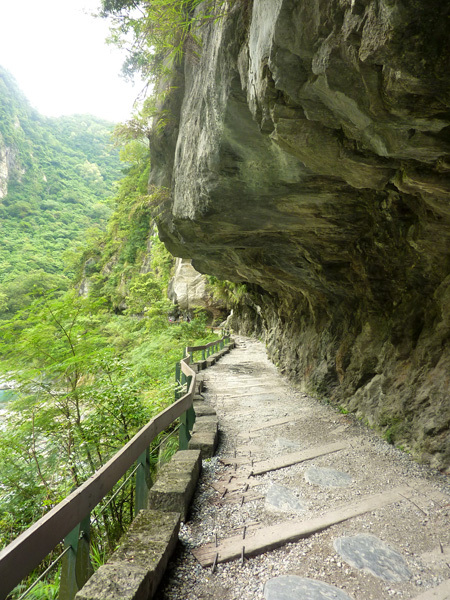 This cliff is on the outskirts of the gorge and used to be a road through the mountains heading towards Taipei. 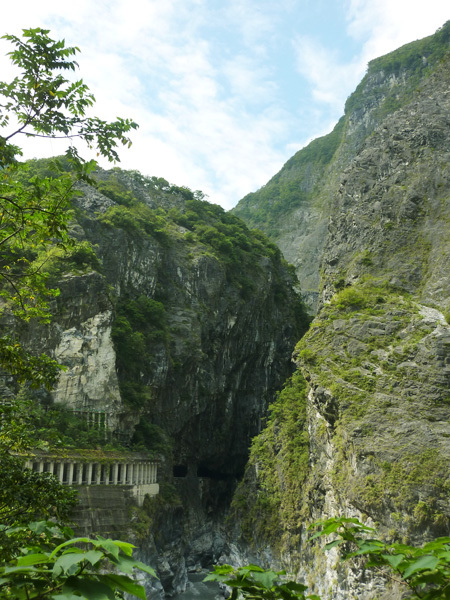 The tunnels collapsed and they were forced to close the roads down. So now it is just a site for taking photos, or a tourist trap. 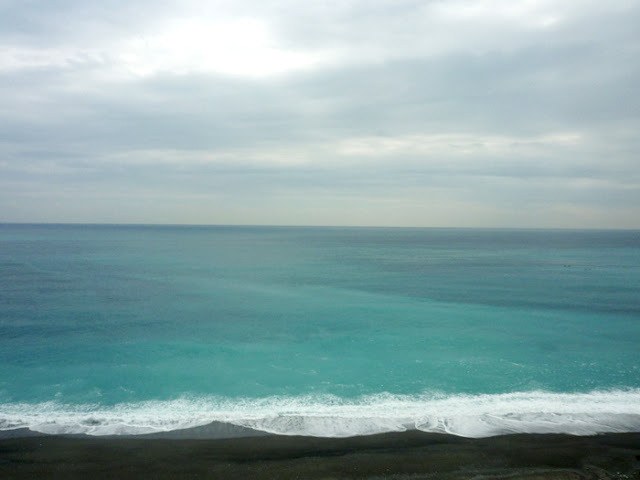 It was a bit hazy that day due to humidity but as you can see the waters are aqua hued! The beach isn't sand but tiny pebbles. We didn't get to go down there by the way, just loitered along the roadside platform. 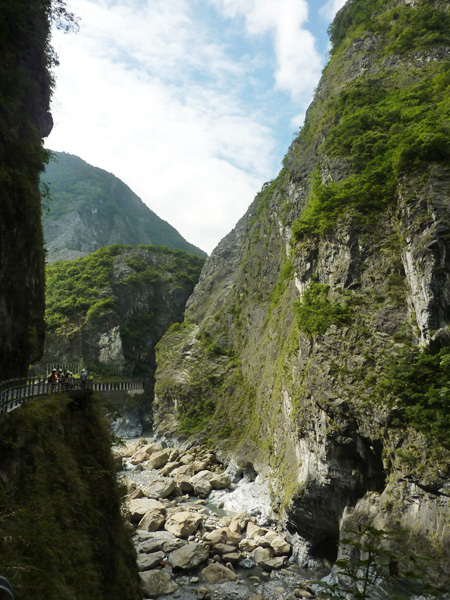 The main archway to Taroko Gorge. Mr Hu said we should take our photos at this gate to prove we've been here. The waters are turquoise coloured! 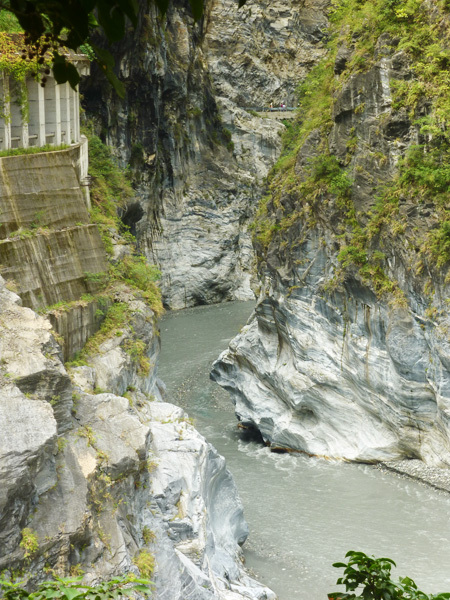 The rocks are marble, thus Taroko Gorge is also known as the Marble Gorge. One of the trails called Shadakang. We had half hour at it while Mr Hu waited for us at the carpark. 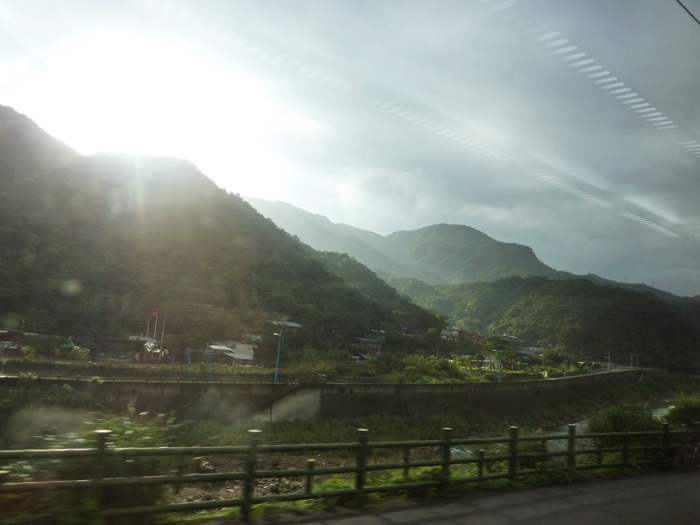 The sign stated aborigines still lived in the mountains and may use the walking trails for commuting. Here's one. 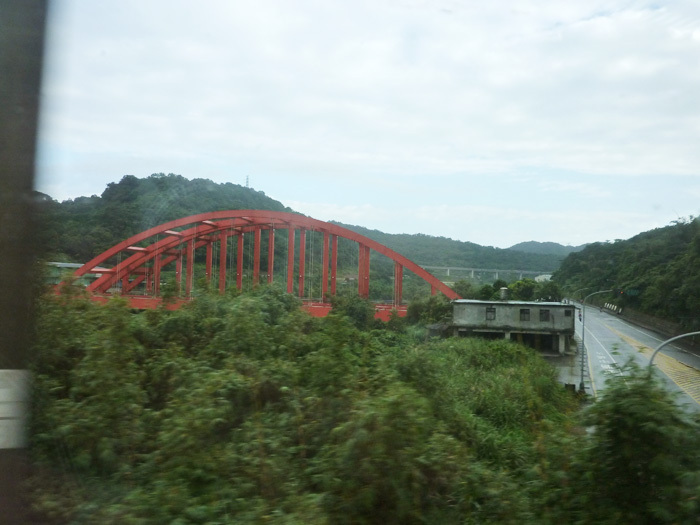 Bridge of a hundred lions. Each carved lion is different. 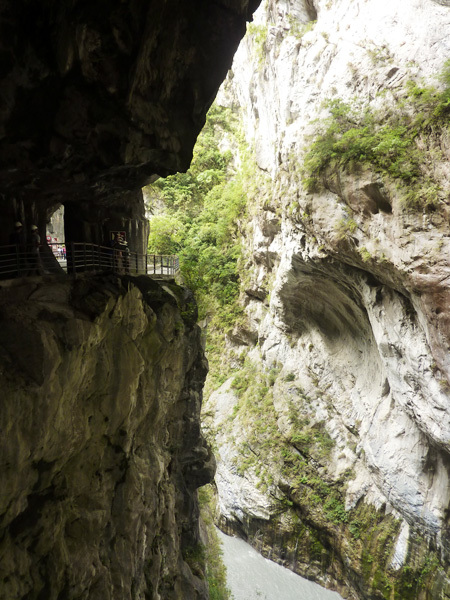 Next we headed to Swallow's Grotto (燕子口). The swallows are only there in June-Sept, after that they fly away so the nests are empty for now. 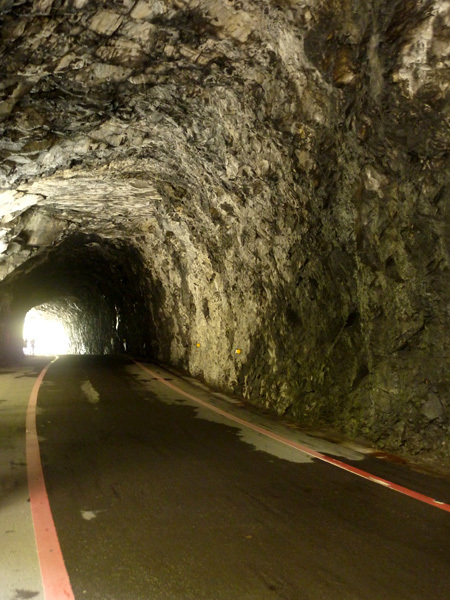 You have to walk through the rock tunnel. 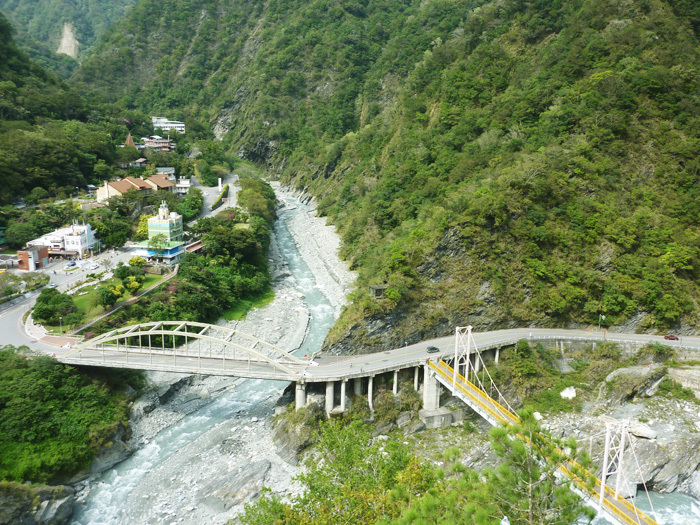 Beware of falling rocks, helmets are advised. I noticed westerners liked to mountain bike or ride their own scooters. City folks prefer the cab. Mr Hu said 80% of his customers are from Singapore or Malaysia... The rest are mostly from Taipei or other parts of Asia. 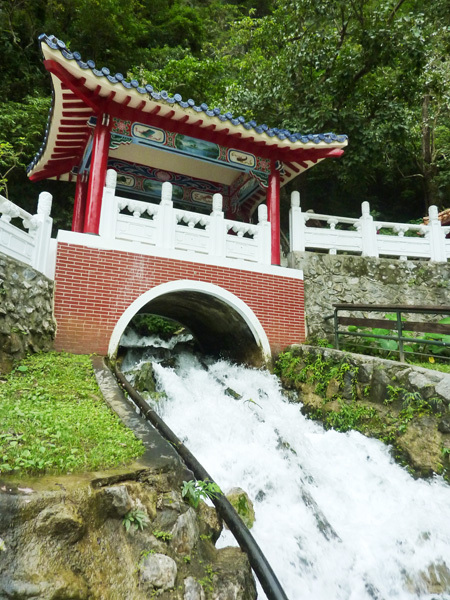 There are abundant tour groups especially during the weekends. 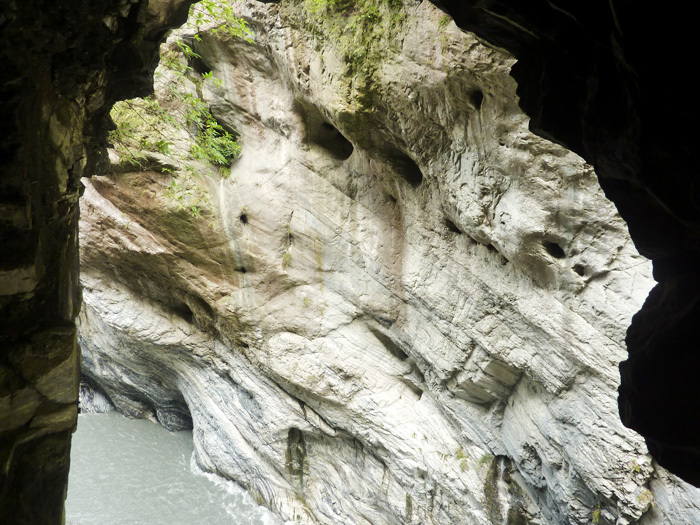 Waters spewing out from the faces of the cliffs all over Taroko, really neat! See the face?? Mr Hu said it was a Native American side profile lol. 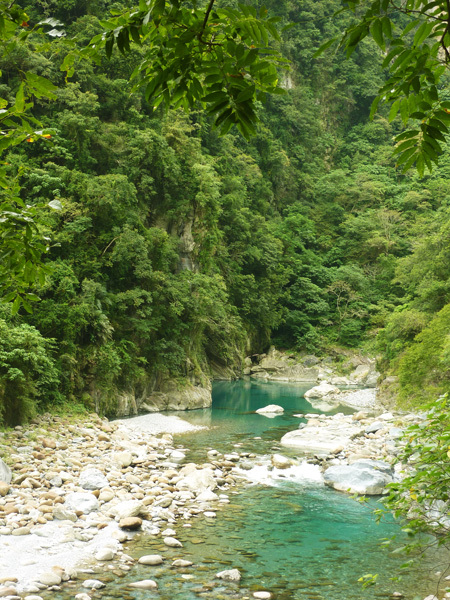 The waters here are grey due to sediments caused by rain up in the mountains. When the sediments settle the waters are turquoise once more. Old and new tunnel. The old one is too small for traffic so only humans walk through it now. Next was the gorge's central village Tianxiang (天祥). They had food, toilets, a buddhist temple and a hotel there. Mr Hu advised us not to eat anything from the stalls due to hygiene. 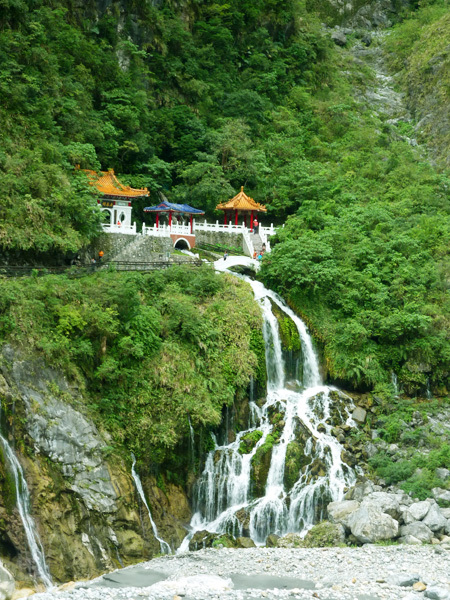 We visited the temple because I read the view there is great! 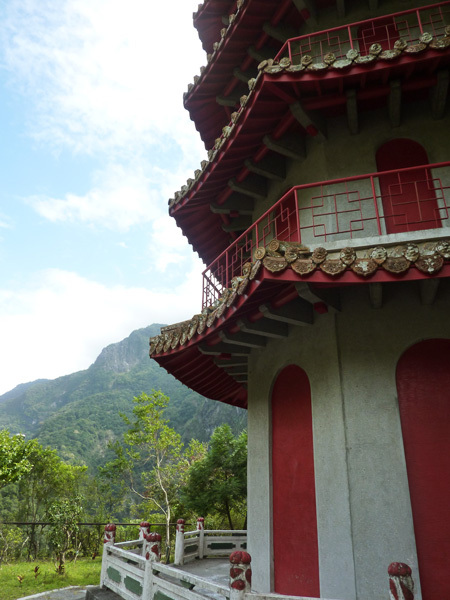 See the pagoda up there? I'm going to climb it. After a ton of stairs we're finally up here. I went up alone my mom couldn't take any more stairs lol. The view was worth the climb but the wind was quite strong and I was getting heebie jeebies from the height. Felt like I was going to get blown over anytime. Next we headed to our last destination. 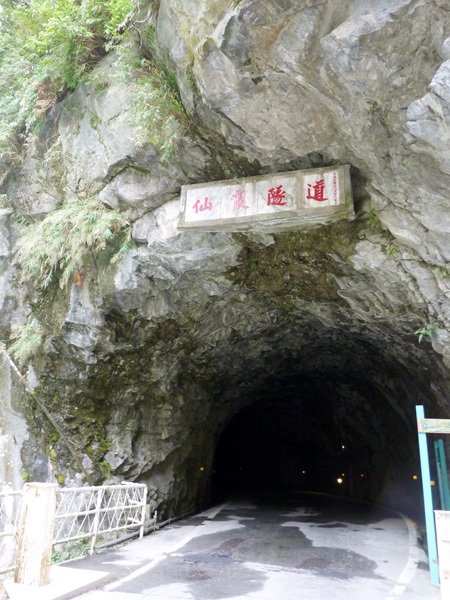 The Tunnel of Nine Turns (九曲洞) was unfortunately closed due to falling rocks. 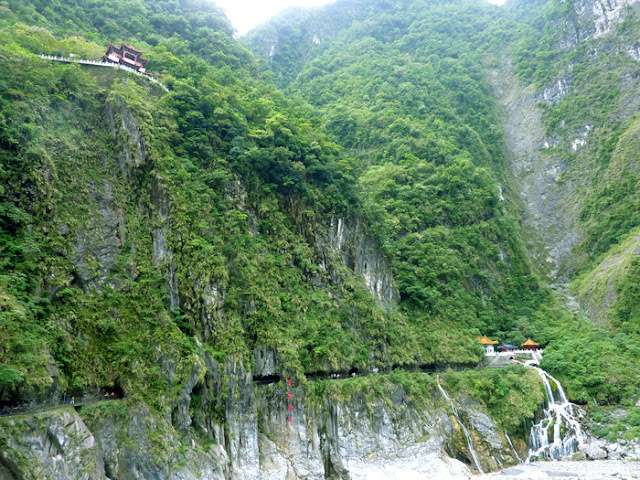 The Baiyang trail which features a 2 hour trek leading to some cool waterfall curtains was also still closed from an earthquake collapse. 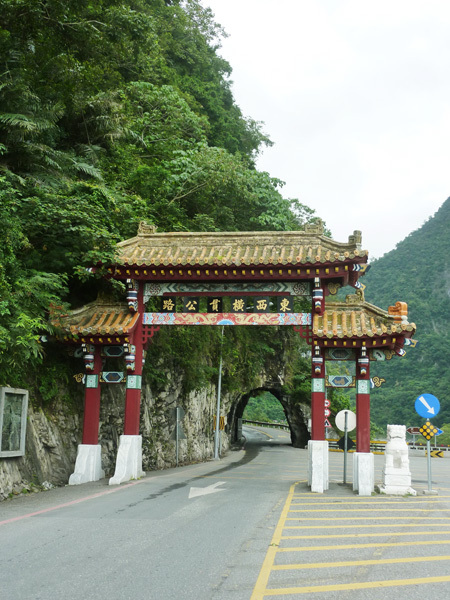 Oh and the road leading to and out from Tianxiang was only open for several minutes per hour due to roadworks clearing a previous rockslide. 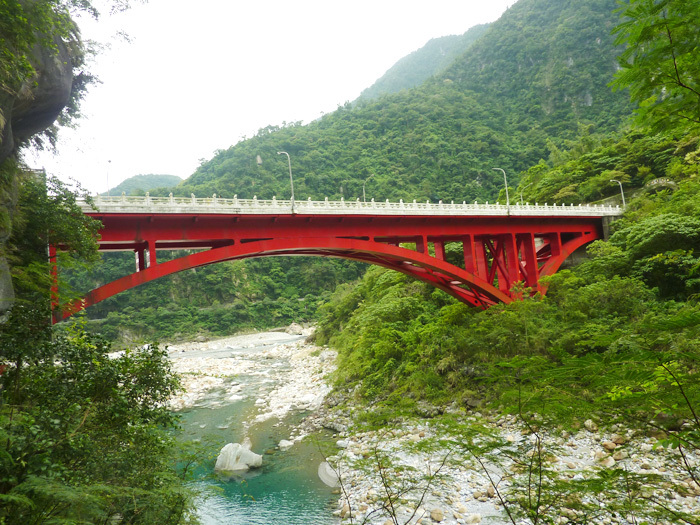 We had to wait 40mins for the road to re-open before heading to the Eternal Spring Shrine (長春祠) below. Mr Hu was playing hokkien music videos on his lcd display while my mom dozed. This shrine serves as a memorial to the 212 workers who died while building the roads. They did the tunnels all by hand, not machinery. 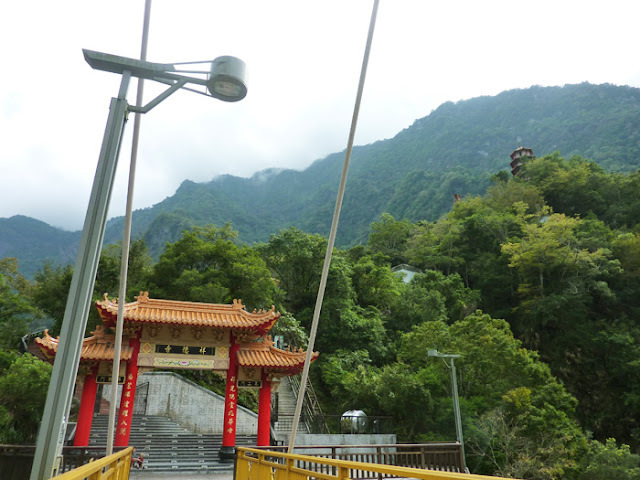 There's a temple up there leading from the shrine... 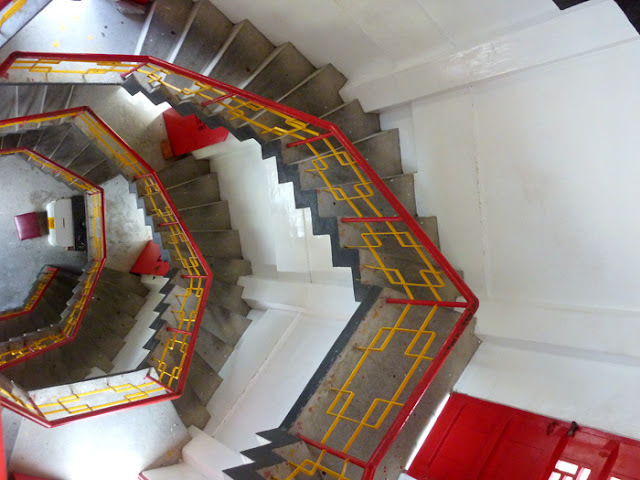 I couldn't climb anymore stairs so skipped it. Very crowded here with lots of tourists from China and Korea. I know it doesn't look it in the photos. We finished our tour at around 4.00pm, he brought us to a little shop where my mom could buy some ornaments (nope no commish). 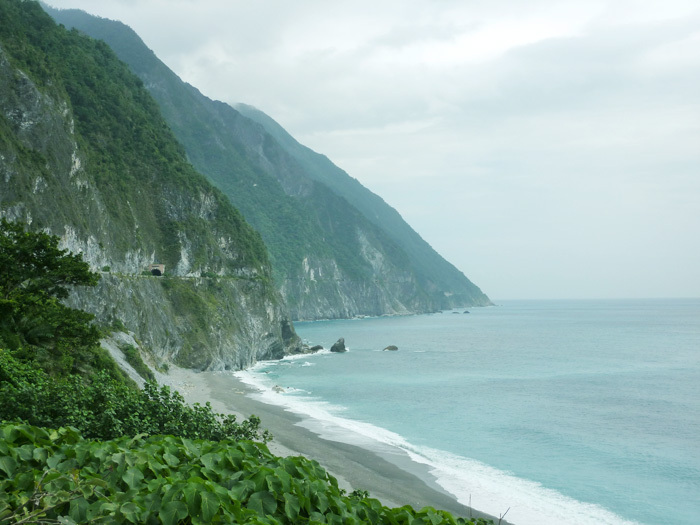 Actually it appears that almost all the rows of shops on that street sell gemstones like jade or rhodonites since it is Hualien's specialty. He said marble factories dominate the vicinity. It was still early when we reached the train station and possible to swap the train tickets for an earlier time, but the tickets for 5pm were sold out and only had standing room available. So we stuck to the 6.06pm train while eating 7-Eleven bento at the station. Same as well. 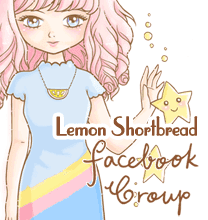 My email is sabwmh87@hotmail.com. Thanks! Hello, may I also have the driver's contact? My email is covellchau@gmail.com . Thanks! !